A lot of people love Jamie Oliver for his informal, cheekie-chappie attitude and antics, which they welcome as a nice break from the seemingly unapproachable TV chefs of the past. Personally, I find his mockney styles and instant familiarity grating, and have let this issue influence my opinion of his cooking. However, I’m big enough of a man to concede that, off-screen, he’s almost certainly a guy I would like, that I have great admiration for his efforts at giving low-income, disadvantaged kids opportunities to work in his restaurants, and, more recently, I’ve come to terms with the fact that he’s a pretty good cook too. From the first, fateful occasion I ate morcilla I was hooked, and since finding a reliable source of it close by us in Brooklyn, I’ve been looking for ways of including it in my cooking. So, giving credit where it’s due, Jamie Oliver’s recipe for squid stuffed with black pudding was just the inspiration I needed. To the naked eye what follows might look like a simple execution of his recipe, but as I say, his recipe was just inspiration. I read the recipe, but did not follow it. I added a degree of chipotle heat to the sauce and switched the white wine for plenty of lemon juice, and to my mind, the addition of some spiciness and acid is what elevates this dish beyond its already delectable level, cutting, as it does, the richness of the blood sausage. Where this dish would sit in terms of global cuisine, I’m not sure. Its inspiration was British, its sauce Mexican-influenced, and its stuffing almost Spanish in flavor, but the dish really worked well regardless of its provenance. 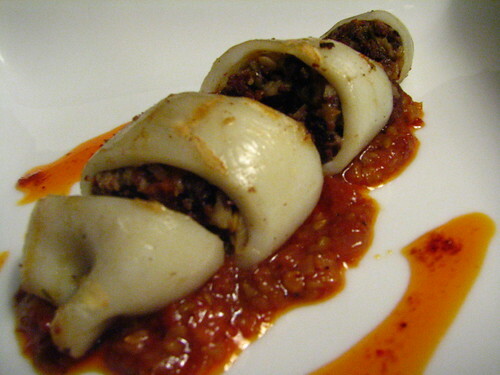 We made it as a tapa, but it would work perfectly as a first course, as a light main course, or even cold as part of a salad, and because the squid look really cool, but are really simple to make, they’d impress the hell out of dinner guests, providing, that is, they were adventurous enough to eat blood sausage. Rinse out your squid with cold water and remove any cartilidge or other crap if you bought them whole. Add oil to saute pan and, when at medium heat, add onions. Allow to sweat for 3-5 mins until soft. Break up morcilla/sausage with your fingers and add to pan. Continue to break up with a spoon while it cooks. When onions and morcilla are well combined, add garlic and paprika/pimenton, and mix well. Increase heat to medium high and add lemon juice. When ready, mixture should be well-combined and pretty coherent rather than loose or solid. Allow to cool enough so you can handle it. Fire-up your grill/barbecue to medium-high. Salt interior of squid lightly and stuff with mixture and “sew” top closed with a toothpick. Do not overfill. 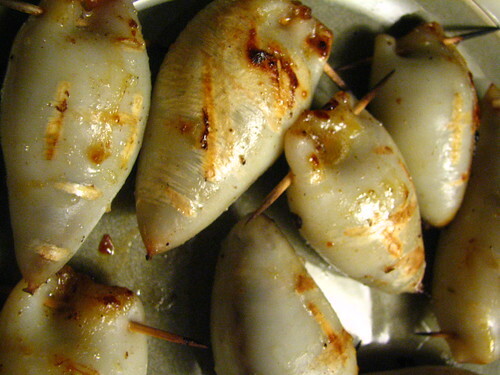 Squid shrinks when cooked and too much filling will cause it to leak and make a mess of your grill. Oil your grill so squid don’t stick and grill them for 2-3 minutes per side or until grill-marks have developed and squid are nice and firm. Remove from grill and allow to come to room temperature. Heat saute pan to medium. Add half olive oil and garlic. When garlic is lightly colored, add tomatoes. Tomatoes should melt into a sauce texture with a little stirring. Add water, salt, parsley and chipotle powder. Combine well. Reduce heat. Add lemon juice and remaining olive oil. Serve over and under the stuffed squid. Bloody nice, mate! So what about blood sausage…they taste dang good. Your plating here is immaculate…let me go open some wine. I’m in a hurry and got to leave now. 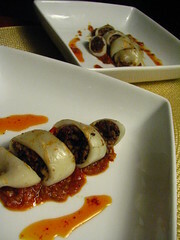 But WHAT A GREAT IDEA TO FILL THEM WITH MORCILLA!!!!! They must have been delicious! I always fill them with rice+tentacles+other veggies. But I Love this recipe! Delicious! I’m so game to try this. I like blood puddings and so does the Mr. So where in Brooklyn does one get said Morcilla? This squid looks perfect. Bloody brilliant! Mmmm, my partner would love this too – he is a black pudding connoisseur! We have a butcher near us that makes a really good one. I agree with all you say about Jamie too. I loved the veal tongue too by the way. Mike: morcilla is available, and surprisingly inexpensive (its made in the US not Spain) at Stinky Brooklyn, 261 Smith Street in Cobble Hill. Helen: it’s a relief to know that there are others out there who feel the same way about Jamie Oliver. Over here in America, they’ve been showing “Jamie at Home” lately, and for all the fresh, local ingredients he’s using, he’s still employing that same overly jocular “a’wight guvnah?” persona that gets on my nerves (I lived in the heart of East London for several years so I love real cockneys, but despise the mockneys). Still, can’t hate too much when this recipe is soooo good! Nuria: thank you! It’s always great to get your feedback. We love Spanish ingredients, flavors, & Spanish people! the combination of fish and meat, especially kinds of sausage, has always struck me as perfect. I remember eating a simple bocadillo de atun y chorizo in a tiny bar not far from la sagrada familia and being almost more impressed by how well the two went together than by the magnificent architecture of antoni gaudi!! I feel the same way about Jamie Oliver. It’s like, no, honey, you can’t just skewer every food on a rosemary branch, “bosh” it in the oven, then dribble creme fraiche and grated lemon zest on top. Sorries. That said, he does make some nice, simple dishes that are easy to reproduce without a recipe. Your rellenos look amazing (I’da added some gochujang to the sauce instead of chipotle powder). I’m pretty sure I could eat a dozen of them! Oooh. . .you keep surprising me with inspired dishes like this. Makes me too envious! That looks fantastic, great photos! They use rice and stuff it inside the squid! These look awesome guy! The blood sausage is especially fabulous and so are your photographs. I love the plating of the squid. I’m really into the sauce with the chipotle powder. Gotta try this right away! I like this one a lot! 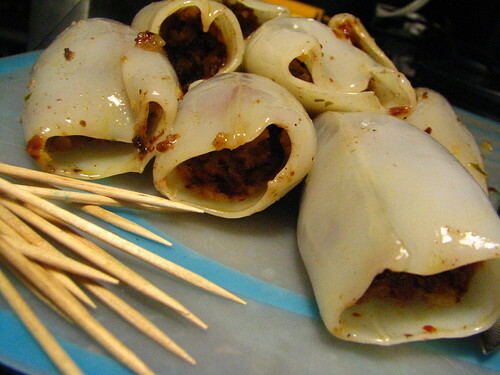 I have a few stuffed squid recipes I am planning (someday), and I may have to add this one to the list. It is SO Iberian to mix seafood and pork products — definitely one of their major contributions to food. Thanks for guiding me, I like this, Peter, my husband does not eat squid, i have to make not too much and enjoy myself : ) great match!!! I was stucked before wondering how to cook in a different way. My Spanish friends cut them in slices and dust with some cornflour and panfried them. Wish I have friends around here to share and enjoy with me. Great recipe. You’re absolutely right about the spice and acid. It’s key. Instead of a tomato sauce, served with a mole poblano. Awesome. Thanks for posting this. @Kara: mole poblano? awesome choice! I wouldn’t have thought of that, but I bet it was delicious!